Ecu Identification The BCM part number is displayed. Self Diagnostic Result The BCM self diagnostic results are displayed. Data Monitor The BCM input/output data is displayed in real time. 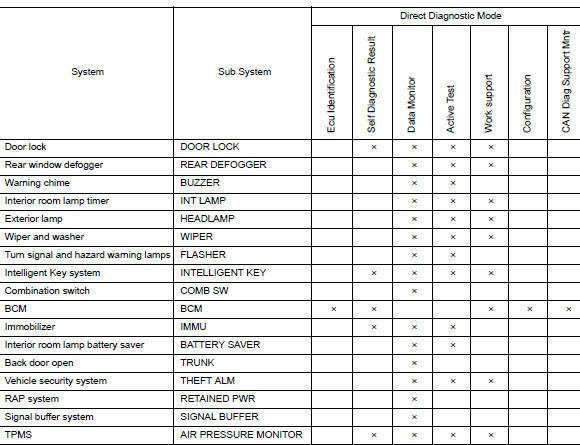 The vehicle specification can be read and saved. The vehicle specification can be written when replacing BCM. CAN Diag Support Mntr The result of transmit/receive diagnosis of CAN communication is displayed. DOOR SW-DR [On/Off] Indicates condition of front door switch LH. DOOR SW-AS [On/Off] Indicates condition of front door switch RH.